Bagration, repulsed on 25 near Bergamo, rallied his troops. Suvorov and Rozenberg organized a three column formation near Ponte San Pietro: the first was a battalion belonging to Rozenberg’s corps, the second the Dendrjugyn Grenadiers, and the third was the Miloradovich Brigade deployed as a second line. Between the infantry were Cossacks. Rozenberg’s troops followed as a reserve. April 26: At 2.00 PM hours, the Russian vanguard contacted Soyez’s Demi-brigade, which had just been replenished with fresh recruits and had been given the mission of the rearguard. Soyez’s Chasseurs fought and disengaged but, at 4.00 PM a French guard of about 150 chasseurs was ovverrun by Cossacks, who ran against a small redoubt in front of Lecco. They were met with a salvo of 25 canister shots which thinned the riders’ rows and caused great disorder. Too late to engage the infantry, because night was coming, Bagration resolved to wait for the next day. Lecco. 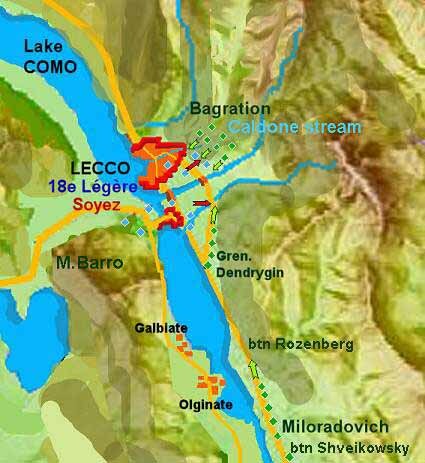 The alternative, and more difficult, way to reach Milan from Bergamo passed through Lecco, on the lower right branch of Lake Como. There was an ancient bridge near Olginate which cross the Adda. Nearby two roads surely existed: one to Milan and one to Como. In 1784, Joseph 2 of Austria visited the town and decided to demolish the town walls. With the arrival of Bonaparte and the birth of the Cisalpine republic, in 1797, the Lecco land was enclosed in the Mountain Lombardy Department ( Lecco became the chief town). 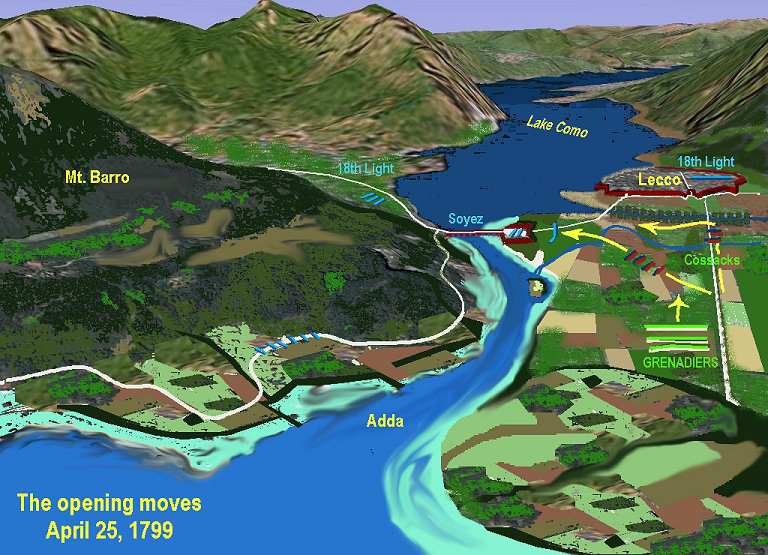 In 1799 the bridge over the Adda, south of Caldone stream, was near the village of Pescarenico, where the battle occured. * Numbers and dislocations are estimated. 30th Light infantry Demi-brigade I Battalion. At Brivio. It is a village built on the Adda river where the hills leave the land to the plains, dominated by an old square medieval castle and situated 15 km far from (south of) Lecco. 9th Dragoon Regiment 1 squadron . At Verderio. On April 1799, the French division Sérurier entrenched into the Villa Confalonieri (today Villa Gnecchi-Ruscone), into the Castle and the cemetery. Surrounded by the Austrians, it was defeated and removed from the rosters. 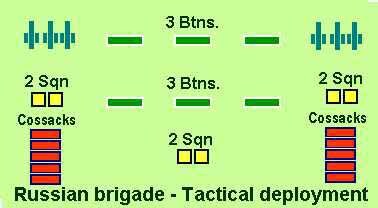 30th Light infantry Demi-brigade 2 – 3 Battalions. 21st Line Demi-brigade Chef de Brigade Robert I Battalion. 9th Dragoon Regiment Chef-de-Brigade Sebastiani 2 Squadrons. 1st Piedmontese Light Demi-brigade the Light Battalion. Prince Bagration took part in many campaigns, wars and battles. In the campaign of 1794, Bargation showed himself as a brave cavalry commander. Suvorov thought highly of his skills, bravery, enterprise and accuracy of his command. The military service under the command of Suvorov had a major influence on the forming of Bagration’s military skills. As a Major General Bagration took part in the Italian campaign of Suvorov in 1799. He commanded the vanguard of the Russian troops. He stormed and seized towns of Brescia and Lecco and executed the most important missions in the battles at Trebbia and Novi. In the well-known Swiss campaign of Suvorov in 1799, Bagration commanded the Russian vanguard, he was the first who accepted the enemy blows when the Russian troops crossed St. Gotthard, the Devil Bridge and others. During the retreat of the Russian Army he commanded the rear-guard, covered the retreat of the main forces and contained the attacks of the outnumbered enemy forces (the Panix mountain ridge). In the Swiss campaign Bagration was Suvorov's most reliable support. For his courage, bravery and military skills he was rewarded with many Russian and foreign orders and arms: including the gold sword decorated with diamonds with the inscription "For courage". Denissov Tichon Ivanovich (b. 1749) from 1793 to 1797 Lieutenant Colonel, regiment-commander of Ekaterinoslaw Cossacks Battalion. April 26, Night. The Russian were masters of the left Adda’s bank. Sérurier, seeing a threat at the Brivio passage, detached Adjudant Général Guillet to cover his northern flank. structure 100 meters long. The Russian moved forward at 8.00 AM but their advance was harassed by the Lecco’s pieces and definitively halted at 10.00 AM. Bagration decided to wait for the planned Austrian diversionary attack at Brivio. Soyez sent the two Grenadiers companies south, to cover his right flank in direction of Olginate. April 27, 2.00 PM. Rozenberg’s Grenadiers advanced against Lecco but were sent back by the Carabiniers of 18th Demi-brigade. The melée was very bloody (Rozenberg’s battalion lost 150 men dead and 360 heavily wounded). The French were the victors, however they began to have a shortage of ammunitions and withdrewinto the town walls. At 9.00 PM a courier arrived bringing a message from Guillet. It was the news of the massive Austrian deployment along the Adda. Guillet said he had to withdraw to Como and left Soyez free to decide to do whatever he wanted. Soyez realized that his right flank was cut off from the Army center and ordered the retreat, in echelons, in order to save as many troops as possible. The impatient Field Marshal, on April 26, had planned that, while Bagration attacked Lecco, forcing the Adda passage, and sending a strong Avantguard to Como, General Vukassovich would gathered as many boats as he could in order to pass the river at Brivio, during the oncoming night. Ott’s and Zoph’s Divisions, with a 3-days food reserve, had to reach San Gervasio and San Pietro to finda good position to install a pontoon, near Trezzo. The avant-guard had to direct itself north, from Trezzo to Vaprio and to join with Vukassovich. The main columns and the rear-guard had to go south towards Cassano. Melas, with the Fröhlich division, had to take contact with the French Cassano bridgehead or Pritorto entrenchments at Cascina Franca and attck them. Count Seckendorff had to move, on the evening of the 26th, towards Lodi attacking that bridge and trying to concentrate the French attention on that city while Prince Hohenzollern, after sunset, had to send patrols under Pizzighettone walls, reaching himself the meeting point of rivers Adda and Po. There he sent spies to spread the false news of the Austrian will to conquer Piacenza. At dawn on April 27, he bombarded the Adda fords and the right Po River bank from Monticelli to San Nazzaro. Suvorov marched with the Austrian 2nd Colonum (Ott), masked by a very dark night in which the wind hampered the sound of moving troops. After having gathered many river boats, Vukassovich sent his vanguards to the other river side and found the parts of a French pontoon bridge equipment, abandoned by Sérurier. Austrian pioneers used it to construct a bridge pontoon across the river. Vukassovich’s patrols went north towards Como; a detachment led by Major Lettnitz engaged the French rear-guard at Olginate and repulsed it. (Erdödy Hussaren) Cdr. Oberst Franz Freiherr von Stephaics, not with Vukassovic. Had 2 Squadrons. Officially Moreau received the Directory letter from a Courier (a letter similar to that of Schérer) on April 26, when the French front line was already pierced. He, coming from Lodi, didn’t know the exact deployment of the Armée. Included the Guards of Light demi-brigade now under Fresia command. Prince Petr Ivanovich Bagration (1765 - 24 September 1812, Simy) joined as private the Astrakhan Infantry Regiment in 1782 and participated in a number of campaigns on the Northern Caucasus in 1783-1787. He served under Alexander Suvorov in Crimea and distinguished himself at Ochakov in 1788 and was promoted to captain skipping the rank of sub lieutenant. Bagration was promoted to ensign [praporshik] on 9 July 1787, to captain on 18 December 1788 and nominally given rank of sub lieutenant [podporuchik] on 9 July 1789. In 1789-1790, Bagration served in Gregory Potemkin’s staff and participated in negotiations with representatives of Ali Mahmud Khan of Persia . He also served as adjutant to various generals, including Count Ivan Saltykov and Johann Hermann, who commanded Russian troops in the Caucasus. In 1790, he participated in the campaign against Chechens. By early 1792, Bagration was transferred to the Kiev Horse Jager Regiment and promoted to second major (9 July 1792) and then to premier major (8 December 1793). On 15 May 1794, he was transferred to the Sofia Carabineer Regiment and served in Poland in 1794. In late October, he led his squadron in a surprise attack against a thousand Polish troops camped in woods with a cannon. Bagration’s squadron captured 250 men and the gun, while the fleeing Poles lost up to 300 killed and wounded. For this success, Bagration was promoted to lieutenant colonel on 27 October 1794. In November, he followed the main army to Praga, the suburb of Polish capital, but he did not participate in the assault because his regiment was assigned to cover the artillery. Bagration was given command of the 1st Battalion of the Lifland Jagers at Volkovysk in the Grodno gubernia in June 1795. After the military reorganization in 1796, Bagration was appointed commander of the 7th Independent Jager Battalion on 28 May 1797. However, his battalion was soon transformed into the 7th Jager Regiment. On 24 February 1798, Bagration was promoted to colonel and, on 28 January 1799, appointed chef of his regiment, now renamed to Prince Bagration’s Jager Regiment. He took part in Suvorov’s campaign in Italy and Switzerland in 1799. Commanding the advance and rearguards of the Russian army, he distinguished himself at the battles at Brescia, Lecco, Tortona, Alexandria, Marengo, Turin, Tidone, Trebbia and Novi in Italy as well as during the crossing of the St. Gotthard Pass, storming of the Devil’s Bridge, actions in Muothatal Valley, Nafels, Netstal, Glarus and the Panixer Pass. For his actions, he was awarded Orders of St. Anna (1st Class), of St. Alexander of Neva, of St. John of Jerusalem, Order of Saints Maurice and Lazarus, Austrian Order of Maria Theresa in late 1799. In 1800, his regiment was transformed into the 6th Jagers (10 April) and Bagration was appointed chef of the Life Guard Jager Battalion on 21 June 1800. Source: Alexander Mikaberidze 2003. Generalmajor Nikolaj Andrejevic Chubarov – lieutenant colonel (from 01.10.1797 colonel, с 20.08.1798 general-major). From 17.05.1797 to 17.01.1799 – commander 8th Rgt. Jäger. From 17.01.1799 to 13.05.1799 Chef (Owner) 8th Rgt. Jäger.